CloudExtend Excel for NetSuite (CENS) allows users to stream their saves searches into Excel for free (to stream in summary saved searches as well as calculated columns you must license our Enterprise Edition). Because CENS uses web services users will see some subtle differences. Note - if your search is failing it may be due to the way NetSuite API sends date fields (for example, created date). The remedy for this is to use the same field but reference it via a date formula instead. Example below. Column headers will use different naming conventions by default. 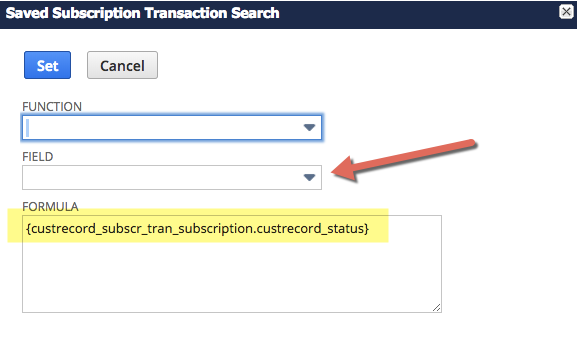 Users can address this by adding a Custom Label in the results tab of the NetSuite search. The sort order of the columns is not respected in Excel. Unfortunately we don't have control over the sort order as NetSuite's web services changes it. Fortunately most users will be analyzing the raw data with pivot tables, charts, etc., making the sort order unimportant. If the order is important and you need to change it each time a simple macro in Excel can handle this for you. References to a related record (such as customer or item from a Transaction search) return the internalID of the record and not the name. Users can address this in one three ways. If your company subscribes to our Enterprise Edition and has our CloudExtend Excel bundle then we've already solved this issue for you and no further action should be required. Adding a join to the related record and choosing the name field from the join, ie if you are running a Sales ORder search and add the Customer field to your search you will only see the internalID. Instead of choosing the Customer field scroll down to the related Customer record field (it will have ... at the end) and then, from the second screen, select Customer Name. Best option for non Enterprise customers: Use a formula field to populate the value. Simply choose Formula (text) in the results field and then populate the value of the formula with the desired field name (hint - use the drop down on the formula field). See below screenshot for an example of populating your results field with a formula. See this video for reference. Confused? Chat with us (link at bottom right) and we'll clear it up (and ideally make our article friendlier).